I am pleased to report that I “think” I am done making improvements to my halyards and vang. (Yeah, right.) I want to thank ALL of you for your unflagging patience these past many months, answering all my crazy questions. I have attempted to combine the best of all your ideas, use the latest hardware and lines, and add a little creativity on my own, too. As always, I welcome your comments. Thanks again for your technical expertise. I really don’t know what I would have done without you all. 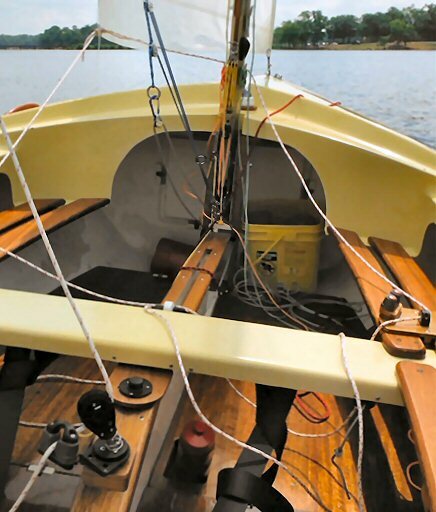 Keep in mind, that I intend to use this boat in the following manner: 80% daysailing, 10% cruising, 10% racing. So, the priority has been given to simplicity and neatness. That is, for example, why the halyard tension control does not lead to both sides of the boat, but terminates amidships. For the same reason, I’ll probably run with the aft seats installed most of the time. Main Halyard (green): The main halyard (green D CL) runs down the sail groove from top to bottom. At the base of the mast, it does a 180 through half of a double block. Then, it runs up almost to the gooseneck, through a block. Along the way up, it passes through a V-cleat. There’s a stopper knot at the bottom end, and a halyard shackle at the head of the mainsail. Thanks for the feedback on my re-fit. These are not nylon Clam Cleats, but Ronstan V-cleats. They are made of glass & carbon fiber reinforced PTFE (Teflon), so their wear characterics should be better than nylon. Time will tell how they hold up. Oh yes, and they are very reasonably priced. 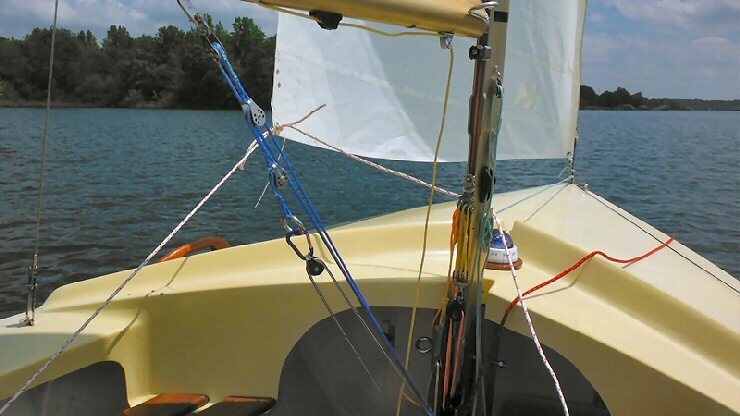 The jib is raised with the orange halyard, all tension being off the secondary (yellow) system. 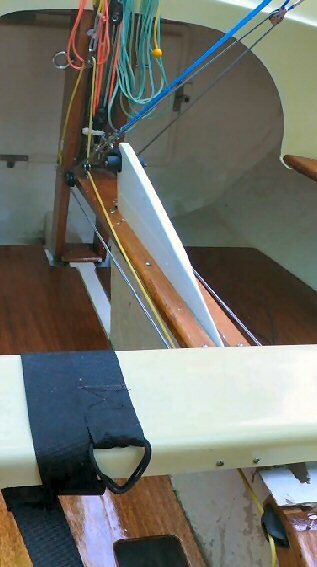 As much tension is applied to the halyard as possible, and the orange halyard cleated off (above right). Uncle Al notes: The latest W thinking is that the mast foot should take the mast weight, rather than the pivot bolt (above left). 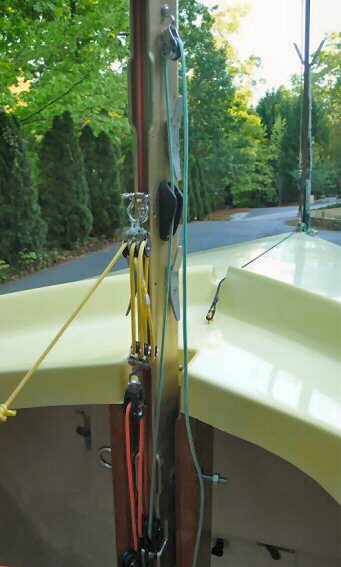 With in mind, it wouldn't hurt to add a shim under the mast to raise it perhaps a quarter inch. That in turn would require a slight lifting of the mast as it comes to nearly vertical to get the mast heel past the shim. Jib Halyard (orange and yellow):The halyard tension control line is then attached to the yellow loop with a (homemade) soft shackle (above). Tension is applied to the control line, and final adjustments are made to the jib halyard/luff wire. The control line leads aft, to a V-cleat amidships (below). Boom Vang (blue): This is a simple cascade system made with blue Dyneema and some small blocks. 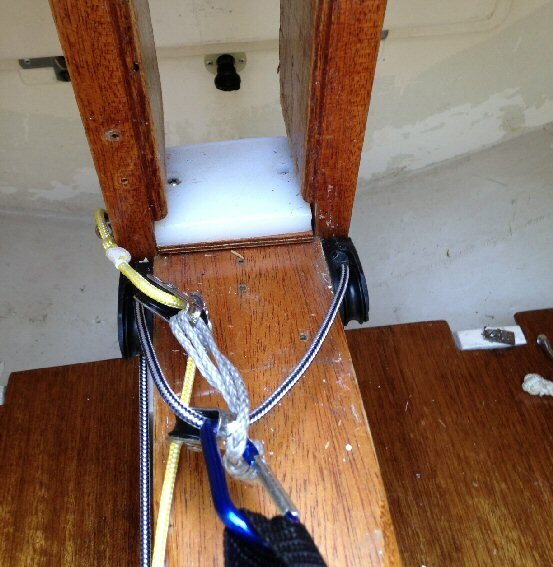 The attachment to the base of the mast is via a bail; attachment to the boom via an existing key slot system. Since the first block sees a potentially high load, it is a high-strength block. The rest are Harken mini blocks. They lead aft via a pair of Orbit 30 cheek blocks. At the thwart, they make a couple of turns, ending up at a pair of cam cleats at the outboard ends of the thwart. Currently, the connection between the control line and the vang is made with a Dollar Store carabiner. I’ll upgrade this to a homemade soft shackle. Conclusion: So, that’s where I am, so far. As you can see in this photo, I’ve installed the reefing hook. That’s in preparation for the reefing system, which gets added next week. The two brass screws are the attachment points for the compass. When this is done, I’ll send you these photos. Incidentally, the yellow ball & line are the outhaul. Seems a little long, but, I’m reluctant to shorten it. You may have noticed in one or two photos, that I’ve cut in the holes for my bailers. I’m waiting on the availability of my First Mate, to assist me in the installation process. I am aching to go sailing right now. The conditions are perfect here, except for a pair of rectangular holes in my hull. This will have to wait a few days, until after our out-of-town guests have gone. Nice to know that you got your boat sorted. Thanks for the report, it was nice reading and it looks like a job well done! I haven't seen a boat yet with halyard tension control led sideways. It is something you set up once, depending on the wind conditions and then don't change it unless there is a severe change in wind conditions. Because the tension is not adjusted often there is no need to adjust it all the time. Your solution is as good as any. The kicker is another matter. Over time the kicker will become a tool that you play with all the time. It is much like the gear stick of your car. It is a control you may want to lead to the sides so you can get at it from the hiked position. I have met people that handle gusts with the kicker rather than using the main sheet. On the other hand, if the kicker control isn't easy to get at, you may never learn to appreciate it. Don't worry about the length of the outhaul; mine is even longer. It allows you to pull it while hiked out. And remember that a rope is never too long, but by definition, it will be too short once you cut it. It's Murphy's law! Uncle Al note: But do remember that the outhaul becomes difficult/impossible to tighten while the sail is full of lots of wind and seriously vanged!! Uncle Al note: This is the opposite of what I recommend. I have not moved my fairleads in 20+ years. I know that many people, including the Hartleys, swear by adding a fairlead block, but my experience has been that even the newest, weakest female crew can get the jib most of the way in. At that point, I make sure the boat speed gets back up, and then luff up briefly after warning my crew this will happen. She or he then has no problems getting the jib in to whatever mark we are using to indicate the full-in position. But THE most important thing is to go out and have fun! Absolutely!!!!! 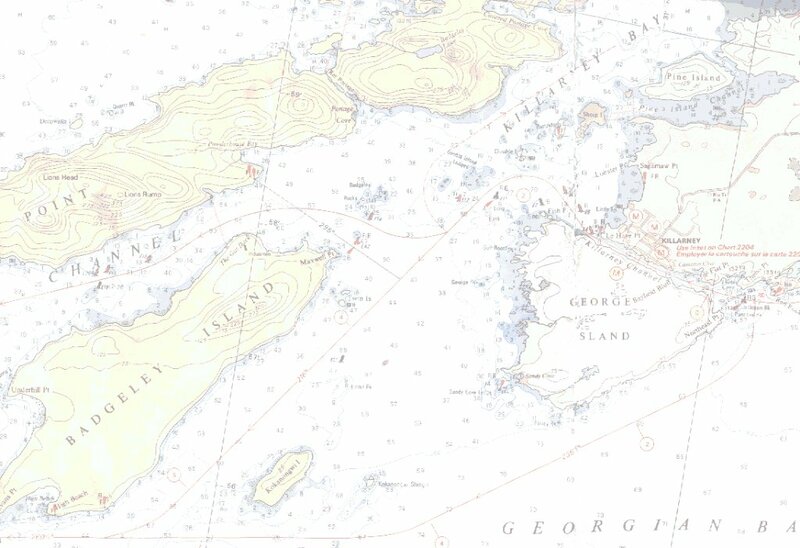 This shows my forward “nav station”; my test location for my new compass. Ton, this is the best (for the money) compass that I can easily obtain in the States. This is the after “nav station”. Currently I’m going to test using my GPS at this point. The presence of additional holes in the attachment plate indicate that this is my second test location for the compass. It is an experimental year on many fronts. 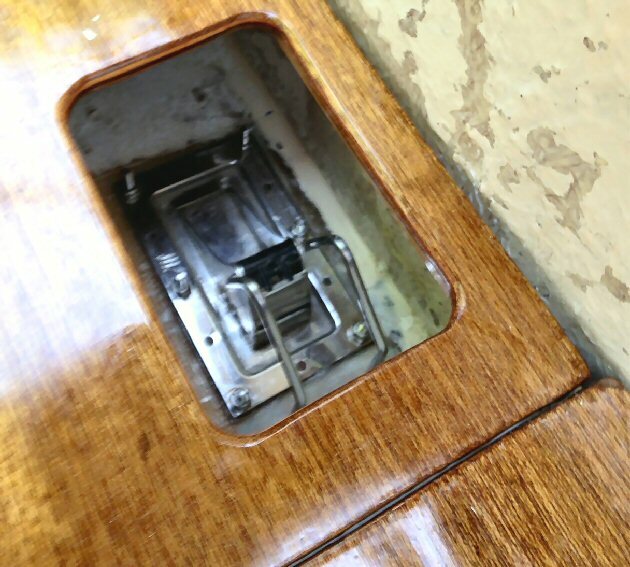 “M” is probably the most significant go-fast change I’ve made to the boat so far—I’ve installed a polypropylene plate that is just is high enough to lift the mast off of the pin. All indications are that I will acquire 30% more boat speed by doing this (tongue-in-cheek). Anyway, there it is. And finally, I’ve gotten my bailers installed (“Bs”). This means that I’m ready to go sailing! Woo-hoo!!! Photos will follow. Hope y’all are getting out and enjoying spring. I know that I am. 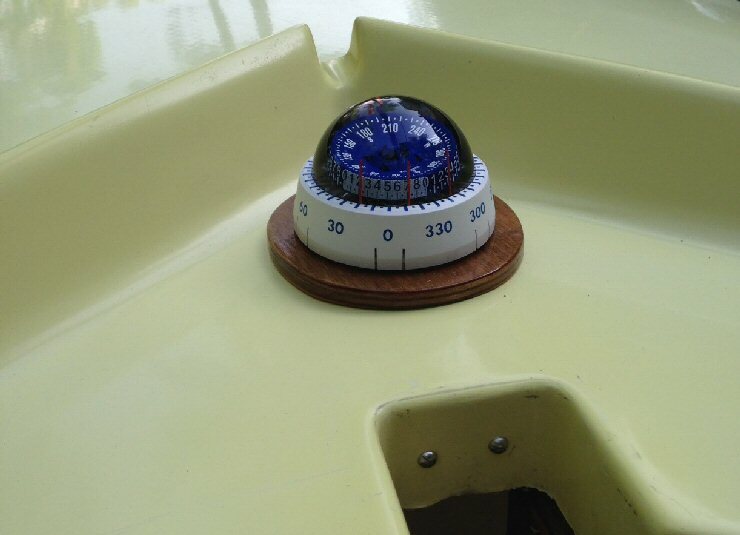 The compass seems a good choice assuming you did not have cut a hole in the deck for it? Moving it to where your GPS is now would give you a weird angle on the lubber lines IMHO. Though it is a bit smaller then a Silva 85, I wouldn't worry about that. Yes, the scale is smaller and hence less accurate, but who is able to steer with 10° on a Wayfarer? (ans: Nobody). In other words; your compass solution is as good as any, IMHO. Please bear in mind I refer to Silva only because I know the brand well (I have had a few). But I have never heard anyone complain about any of the other brands out there. A word of caution may be in order for others that read our email exchange. Simple compasses are bound to certain parts of the world. A compass from Australia won't work in Canada and visa versa. Here is why: Magnetic field lines come out of the North pole and go in to the South pole. In other words , the field lines on the North pole are straight up, and on the South pole straight down. However, near the equator the field lines run in parallel to the Earth's surface. This means that in the Northern hemisphere the Magnetic field lines gradually go from straight up to horizontal. Whereas in the southern hemisphere they go from parallel to straight down. So, where you live they may run at an angle compared to the earth's surface. In small light weight compasses this angle has to be compensated by balancing the compass card. Obviously this balance is different if the field lines are at a different angle. A card of a compass from Australia will jam against the glass or at least be at a funny angle at your location. For example: Silva has divided up the World in five or six regions and they balance their compasses specific for one of those regions. And to complicate matters, the borders of these regions are not straight lines, they curve around the world depending on the Earth's crust's content (i.e. Iron or Iron ore content). There are compasses that don't need regional balancing but they are big, bulky, expensive and not suited for boats like a Wayfarer. Heck, they don't even fit on larger yachts. What do we learn from this: Never buy a compass outside your own region, not even if it is at a bargain price and sent free of charge (Ebay)! 1. 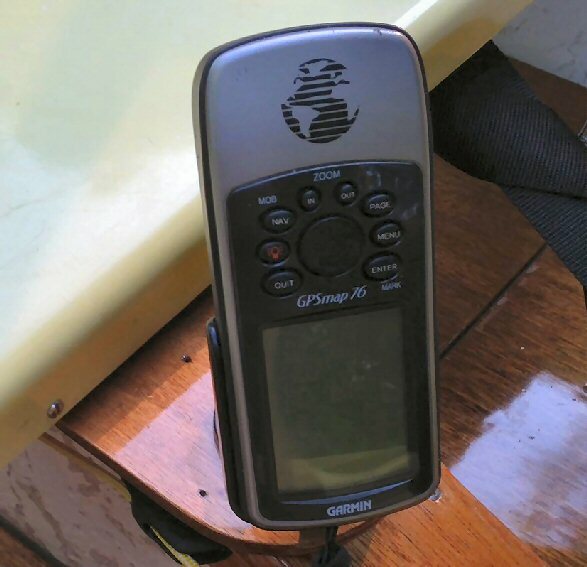 The LCD does not allow large viewing angles, so, unless you have it on some sort of a turning table, it will never be in a good position to look at it, unless you are standing in the middle of the boat, like on a dead run. 2. It is too far aft for any of the sailing positions you are in. The Helm tends to keep our weight near or above the thwart and only in a plane the helm moves one or two feet aft. 3. You will trip over it in a gybe or when going about and if not your sheet will yank it off (4). 5. Does it have a true daylight (sunlight) LCD or is it like my phone, readable only in the shade? Then what is a good location? I hear you ask. The filling piece below the mast is similar to the Delrin packing piece I have. But mine is in between the hull and a mast track. 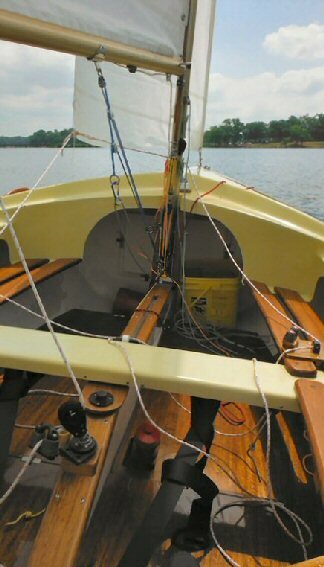 Not that there is anything wrong with the mast straight on the filler piece but how do you prevent the foot of the mast from moving too far aft, jamming the bolt? 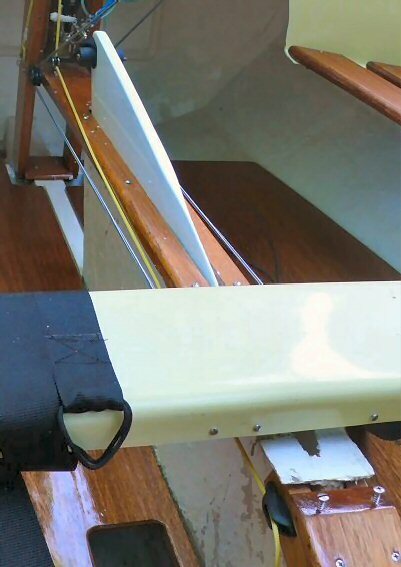 Preventing sideways movement also improves the boats characteristics, as do sideways chokes at deck level. I think you should put a mast track on your wish list too. Having said what I had to say, it is most important that you go sailing and enjoy! We'll continue our technical nitty-gritty in six months or so. Had ideal conditions today, so I took her out solo (using the jib Chip talked me into buying). Everything works great! I love the compass location. The controls were splendid. 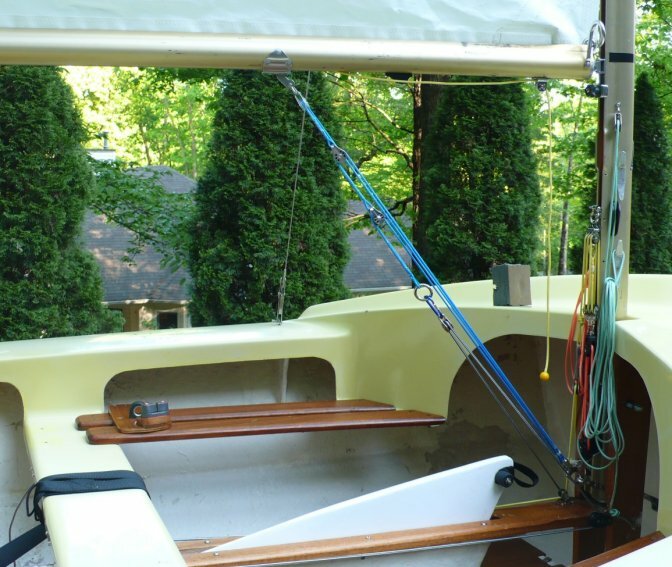 Marc, the triple air block jib halyard system you suggested works like a champ! I’ll be anxious to check the boat for threshold values on shroud tension. Does anyone in NC have a shroud tension gauge? I have a Loos gauge but tend not to use it any more. I was religiously sailing to the “numbers” as indicated in the Wayfarer Book but found the boat felt dead at times and didn't point well. I fell back to Uncle Al's method which is to sail with the leeward shroud just taut in all conditions. Also, The Jib sag should be about 3 inches in comparison to the forestry or an otherwise straight line from the mast to the bow. I guess if I could make any suggestion it would be this. Use the Loos gauge to make sure you can achieve maximum tension. Perhaps use the Loos gauge to mark the tensions points for low, medium, and high wind. But I would consider them starting points and would experiment from those point. In general I found them to be to tight. But that is just me. I am sure Al has a photo of me with the jib too loose. This is a great topic for discussion for early spring. I am sure there are fine points I have missed and I know I make mistakes.. I am hoping the others will wade in with an opinion. 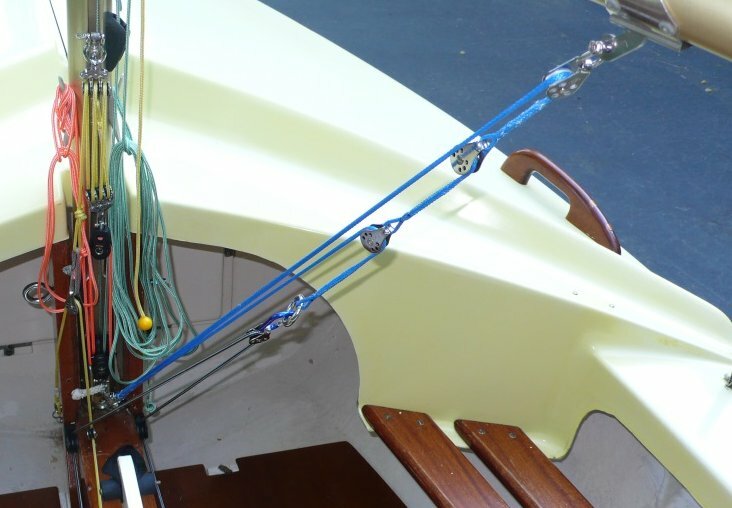 "Identifying a jib luff entry that is too flat: A sure sign (on fairly flat water, anyways) that the entry is too flat due to an overly tensioned jib halyard, is ticklers that are jumpy: from one second to the next they switch from indicating luff to showing stall, sometimes both at once. If this totally unacceptable state of affairs exists, we start easing our jib halyard in small increments to make the entry rounder until the ticklers settle in such that the jumpiness disappears. At that point, we have theoretically got our jib halyard tension (and its attendant entry curve and steering groove) to its optimal setting for the conditions. 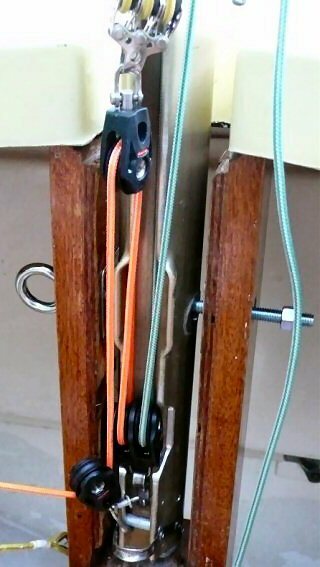 And, we have set the correct rig tension at the same time, since the jib halyard/luff wire combination is deriving its tension by pulling against the resistance of the shrouds (remembering that on dinghies, the forestay is set loose enough that its function of holding up the mast is taken over by the jib halyard almost as soon as the jib goes up)." In so many words: "Lose the Loos!" PS: Don, Richard has provided your best approach: leeward shroud tension, which method Mike Mac taught us, and which is easier to check than my current method. Which however should be kept in mind, i.e. 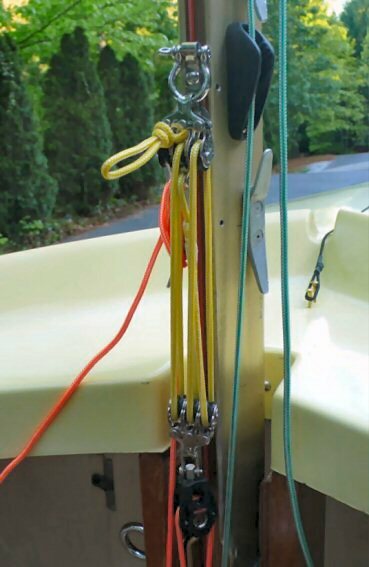 if your ticklers ever get jumpy, ease the jib halyard until they settle down. Subject: First Time Out - ALARM! While looking at your pictures on the Whiffle Web, I noticed something that made all my alarm bells go off. Apparently you have used a bolt as a mast pivot pin. Not that using an ordinary bolt is a bad thing, I used one for years. But it is a bolt with full thread. The thread works like a file and will damage your (Aluminum) mast and tabernacle! What I used to have was a galvanised steel carriage bolt with a wing nut and two large washers. The bolt only had half an inch of thread. Once mounted none of the thread was in the mast or in the tabernacle. Please do yourself a favour and spend 20 cents on a galvanised carriage bolt and a wing nut. If you make sure it is at least 6 mm in diameter it will comply to the class rules as well (racing). BTW, I suspect the picture was taken before you added the packing piece below the mast? I mean the holes clearly don't line up and the mast seems to be resting on the bolt.